Yes, 妹萌え, imouto moe (little sister moe)! Petite sœur moe! 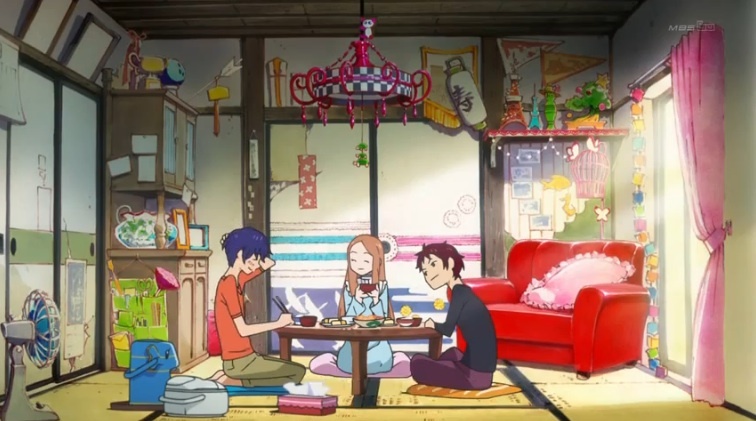 Since Oreimo, Mawaru Penguindrum would be an imouto moetic anime! Yes. Himari-chan! The Takakura three siblings. Two older dudes. And the youngest one is Himari. But she dies from incurable disease (if only she had Black Jack) but suddenly resurrects like Jesus, wearing the Rockhopper Penguin hat on her head. The Queen Penguin hat has some kind of supernatural power like phoenix. 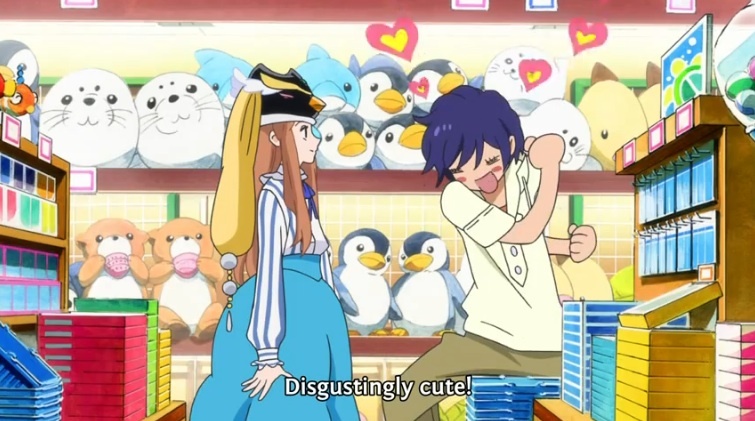 Yes, penguin is cute and imouto is cute. Double cute! Moe!!!! 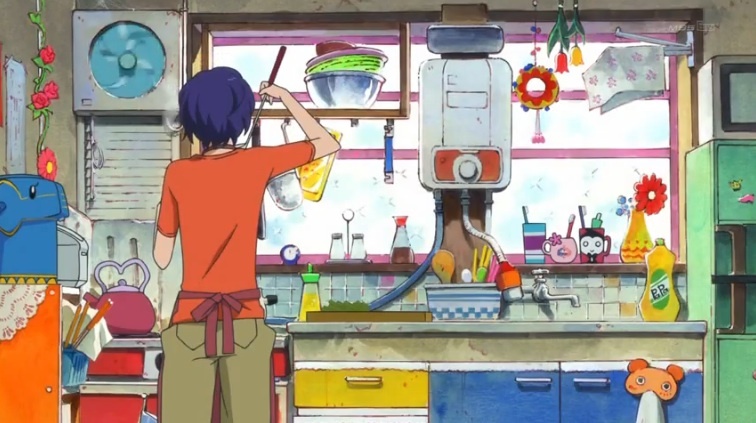 And their humble-looking house is colorful, very Dodesukaden feel to it. 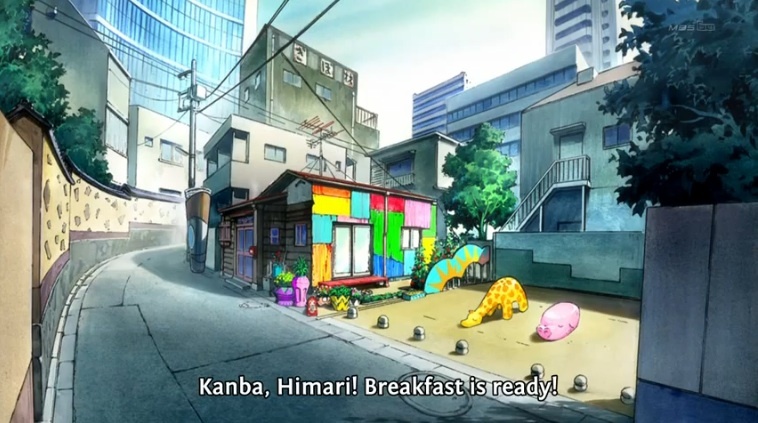 It’s totally Himari’s umwelt! It shows that two brothers are totally devoted to cherish their only sister. Yes, from what I see, they seem to have lost their parents. So, those two brothers are playing the parental role. But why penguin? Of course Himari’s favorite bird, but I never heard any folklore about penguin. Prinny from Disgaea saga? 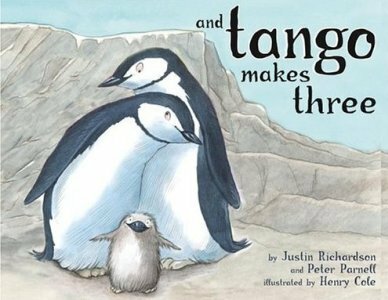 Any culture has mythology dealing with penguin? In Japan, cormorant was a sacred bird. It was particularly revered among fishers. Cormorant’s feathers were used for the roof of the birth hut. In fact, one of the imperial ancestors was named Ugaya-fukiaezu-no-mikoto (unfinished cormorant feather roof). The naming is like Dances With Wolves. But now, penguin has replaced cormorant in modern Japan. In fact, 1/4 of world penguin population are now in Japan. Japan has been breeding a lot of penguins for zoos. As a result, Japan has become the most populated penguin country on earth. So, Japan’s national bird should be penguin instead of crane. Yes, penguin as new phoenix, longevity, immortality! And probably Mawaru Penguindrum is based on And Tango Makes Three. Roy And Silo as Kanba, Shouma, and Tango as Himari. 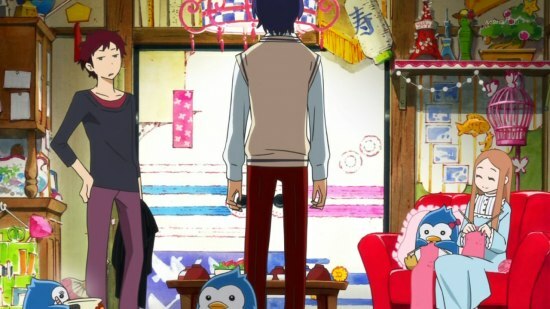 Roy and Silo are parenting Tango, just like Kanba and Shouma parenting Himari. Moreover, penguin resembles human, so that may be why we feel more attached to it.. In Japan, penguin is alternatively known as jinchou (human bird). But yes, imouto is divine! 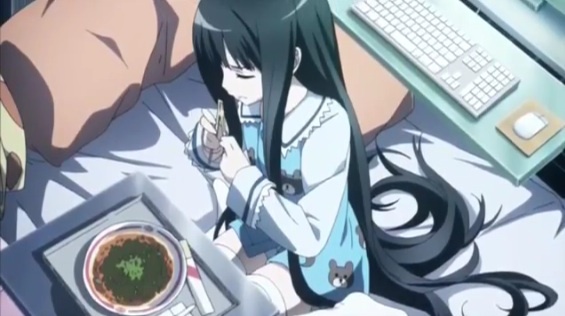 I want to make Alice from KamiMemo my imouto. A little girl acting big is rather insolent. And ironically her insolent attitude makes her utterly cute, kakakakaka! Exactly La Petite Princesse. Because she acts big despite her smallness, she’s overly cute! And despite her smallness, she thinks big. Her big attitude and big thinking exaggerate how small she is! Yes, like perspective drawing comparison. Yes, anything small is cute. Small is beautiful! 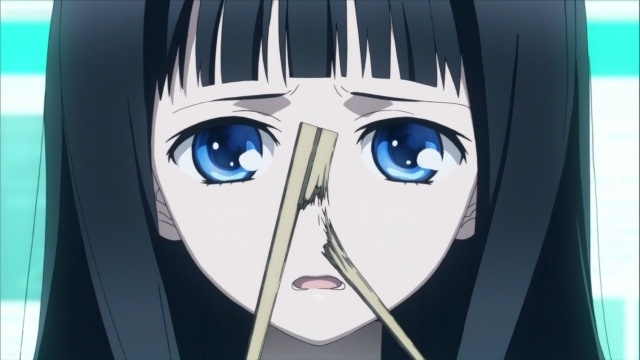 She can’t even split a chopstick by herself! OMG, makes my head explode! I want her to be my little sister! Yeah, I desperately want her to call me “onii-chan (older brother).” Ushishishishi! Ah, I just need a girl. I don’t need anything else. Just girl’s love. And an imouto would be awesome. Because she accepts you unconditionally, like Tora-san is a NEET but his imouto Sakura still loves him. No girl loves you unconditionally other than imouto. Everyday, you’re losing your precious soul little by little by constantly struggling to prove that you’re marketable and productive enough to be loved by 3-D girls, and by the time you realize it, you’re dead, worn down by stress. So, why labor? Totally absurd. Call me “onii-chan” or give me death! I’m still getting used to this show. But here’s one thing I know: it rapes the concept of miracles with a loud and fucked up mockery. I think the Penguin thing comes from Pen-Pen. Oh yeah, I remember that hot spring penguin! In fact, zoo penguins in Japan can’t live in antarctic anymore. How genetically modified they are. I don’t know why, but that Penguin is just too cute. Seriously, why am I attached to it? Why is it my avatar?!? !